Hi Guys, I thought it was about time I wrote on the blog again, been a while! So, I last wrote from Chiang Mai...we'd been on a trek, a very event full trek! And then we had a weekend for the Loy Krathong festival. Probably one of the most amazing light festivals I've seen - England's fireworks night has nothing compared to it. The weekend began with a parade through Chiang Mai, girls dressed up in imculate make-up all sat on big floats. I had a truck pass me at one point with about 30 massive speakers all attached via one rope - looked pretty unstable. The days consisted of fireworks going off in every direction, kids holding Kathryn wheels in their hands and just throwing them into the street; the pavements weren't safer than the roads - it was just one huge fireworks party! The nigh time was just as bad, literally every time you step out into the street there seemed to be a firework going off in your direction, for Lucy who hates fireworks, I think it may have been a pretty bad time for her! Along with the fireworks were the lanterns - the sky was filled with hundreds, it looked amazing to watch. It was almost like we were in some out of space atmosphere, pretty lights filling the sky like a carpet, it was very 'Soi' - Beautiful! Me, Lucy and Laurence bought some and sent them off into the sky with messages written on them, was quite a magical moment! The Thais also celebrate with flower Katong - a handmade little boat that is sent off into the water to wish away any bad spirits and bring good luck ( I think we needed it standing amongst all the crazy fireworks!!)... We made them in a little family run restaurant one night from bamboo and flowers, then in the middle we put an incense stick and a candle. I felt very spiritual and happy that evening, I could feel ext year was going to be a good one with all the good luck I'd wished on myself! We left Chiang Mai a few days later and took an overnight train down to Bangkok and then another onto Chumphon, the ferry port to get across to Koh Tao. The journey took us over 24 hours, due to our 2nd train breaking down in the midday heat - HOT! We stayed one night in Chumphon and the next morning, early, we took a boat across to Koh Tao. We arrived to sunshine - Yey! and checked into Crystal accommodation where me and Lucy were booked into doing a PADI Open water diving course. We spent 6 days on the island, 4 of which me and Lucy were diving. Probably one of the most enjoyable and memorable experiences of our trip, I loved it all! We were diving with 6 others, all novices like us. We spent 2 days in the classroom learning all the 'serious' stuff and had one test to check we knew the knowledge and then 2 days of diving. We had to do 4 open water dives to qualify. The first 2 were to 12 metres and the 3rd and 4th were down to 14metres. The 1st dive we did was simply just to get used to all the equipment, the sea and explore a bit of the area - see some fishes! The 2nd dive was more skills based, we had learnt several skills in the swimming pool the day before so we all knew we could do it, but needed to test it 12 metres below sea level! One task was to descend down to around 6 metres and then take one big breath in and slowly breath out whilst releasing small bubbles and saying 'ahhhhhhhh' whilst going up. I found it hard to equalise a couple of times so had to keep stopping but eventually I managed it. We then all met 12 meters below on the seabed and knelt down til we were all there. Visibility was awful and made me a bit panicky..we couldn't do anything about it and I could hardly see an arms length in front of me! Once we were all down, we had to do another task - partially fill mask and then empty the water. We then had to pretend we'd run out of air and grab our buddy's attention to share theirs...Involved taking the reg out and blowing small bubble of air out then replacing it with your buddy's air source. Both of these I managed fine! Next came the scary bit....we had to fully flood our masks. Considering in the pool the water wasn't salt and we could open our eyes it made it a lot easier. At 12 meters below, a lot harder and scarier! Makes my heart race just writing this now... I pulled my mask away from my face to allow it to flood, replaced it and then attempted to empty it. Something in me, weather it was because I couldn't see what I was doing, or I tried to breath through my nose and forgot I still had air to breath from - I panicked!! I wanted to go up to the surface, Ian our instructor was holding me down and trying to calm my breathing. I could hear him trying to talk through the reg to calm me down, it felt like time had stopped, my heart was racing and I really wanted to get out of the water, but I couldn't I would have failed the PADI course. Ian pumped some air into my mask to try to help clear the water, if I tilted my head and opened my eyes I could vaguely see him looking at me. I tried to clear the water and after about 5 attempts it worked, but I was so scared. Ian hugged me and moved onto the next diver to practice their skills! Later in that dive we had to re-attempt the fully flood, as soon as I saw ian make the sign to do it my heart started racing - he held my hand tight and I did it!! The next day we had our last 2 dives, this time down to 14 metres. We were being filmed for both to make a dvd, so at 7am we all sat out on the beach introducing ourselves whilst having a video camera shoved in our faces! The first dive took us to 'White Rock', and we had to perform another mask skill where we take it completely off and then back on again, Ian had given me a pep talk on the boat so I felt more confident but to be honest I was still a nervous wreck about doing it. I knew if I thought too much I'd freeze up and be unable to do it, so I just got down there and did my best. I was a bit gutted as everyone else did it to the camera and had a pair of aviators on to replace the mask and did a dance..looked pretty cool! There was no way I could manage that, so I just took it off and put it on V quickly, I did my own victory dance to the camera with Ian once I'd managed it! During the diving we'd been told we may see a turtle...and on our 3rd dive we did!! I had such a magical moment, I got to swim alongside it on camera. I looked around and everyone else had gone, I was swimming with a turtle on my own, Jase the cameraman beside me and Ian behind. I couldn't quite believe it, the turtle was in his own world oblivious to me and I was in my own world, all I could hear was my own breathing. I was a fingers touch away from it, following in its path...something I will remember for the rest of my life. Incredible experience! 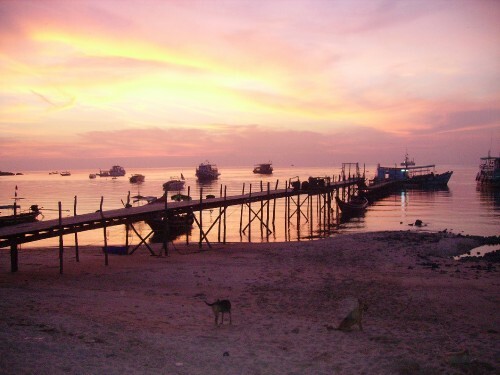 I loved Koh Tao, it was a beautiful small island; diving made the week for me. The people were awesome and I feel privileged to have achieved my Open Water course in Thailand! We continued on our journey to Koh Samui where we met up with two friends Holly and Bex, didn't really like the place. Wasn't great weather which probably had an effect but it seemed more like a holiday resort like spain or something than the picturesque Thailand I had hoped. We then moved onto Koh Phagnan with the girls and spent 4 days together - sadly almost every day was raining! There was nothing to do, so we spent our time hopping between cafes watching daytime movies and reading books. We went to the Black Moon party one night though - can't say I remember much, but lots of fun! Bright fluorescent body paint and buckets... We stayed 2 nights in Krabi, and one day at Railey beach (famous for rock climbing), then me and Lucy left the girls and came over to Koh Phi Phi which is where we are now. I am sat in an Internet cafe looking out onto the sunset over the sea...amazing to think that 7 years ago this place was in a terrible state after the Tsunami. The people here are so friendly and I can see how many backpackers would get 'stuck' here. It's beautiful beach's and lively nightlife are easily addictive!..